As a daily information portal that collates Australian media articles from a 24 hour cycle, Making Enviro News is in a unique position to review what articles and topics are generating the greatest interest. Topics covered are quite extensive and relate to anything in the environmental/sustainability area – climate change, environment, sustainability, conservation, energy, infrastructure, waste and recycling. In 2018, readers accessed 11,768 articles which provided us with some interesting insight into what have been some of the trends amongst our readers. As part of our service via Facebook and Twitter, we report on the top three most viewed news items. The most viewed story in 2018 was Debbie Cuthbertson’s article in The Age on 31 January 2018 – ‘Recycling rout was a disaster waiting to happen’. Here are the top stories by month. 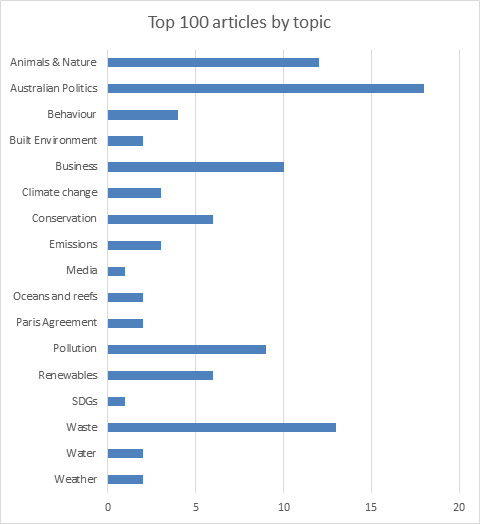 The majority of our readers were interested in what our politicians were doing in environment/sustainability/climate change area with waste and recycling also hot topics predominantly driven by China’s decision to stop taking Australia’s recycled waste and plastic bag bans and the ABC’s 2018 television series in the War on Waste on the ABC. Specific topics that dominated readers’ interest in this area were varied. It included articles relating to energy such as the national energy guarantee, related policies, land clearing and again waste and the recycling industry. The following snapshot is of the top 100 news items accessed and broken down into broad topic classifications. Not surprisingly most articles would cover more than one topic, but for simplicity we chose the main topic featured in the article. The top three topics were Australian politics and waste as well as animals and nature. It is interesting to observe that our readers are interested in learning about various animals, newly discovered species and natural phenomena. Not surprisingly, Australian Geographic and Cosmos Magazine dominated in this area. As a free service, although we provide articles from subscription sources such as The Australian Financial Review or The Australian and other News Corp publications, we give preference to non-subscription media sources. Looking at the most popular publications is interesting but it should be noted that it is skewed to non-subscription publication. Making Enviro News links to many news sources including specialist publications such as RenewEconomy, The Fifth Estate and Mumbrella, to name but a few. 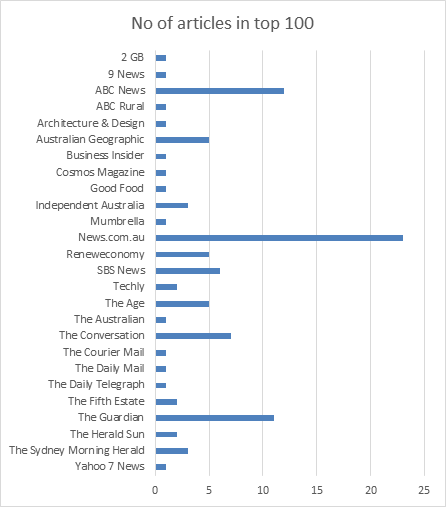 Nevertheless, our readers have a tendency to favour the major news sources such as News.com.au, ABC News and The Guardian. It is easy to hypothesize about the reason but without additional research, we cannot make any solid conclusions. Still, it is interesting. For some years now, in addition to news articles we have also been providing access to reports. The main observation for 2018 is that the more frequently accessed reports had a business focus. Here are the top five accessed in 2018. From a news perspective, 2018 provided a lot of diverse information from an array of media sources. The interesting fact that we noticed here at Making Enviro News was that Enviro News, in the broad sense of the term, was covered by a far greater cross section of publications. News items regularly appeared in fashion publications such as Vogue Australia and Marie Claire. Industry specific publications were also providing more enviro news. Today, enviro news impacts all walks of life and this is reflected in the media as articles appear in in almost all areas of interest, from leisure to business. How the increase in coverage is having an impact on behaviour, well I will leave you to be the judge.